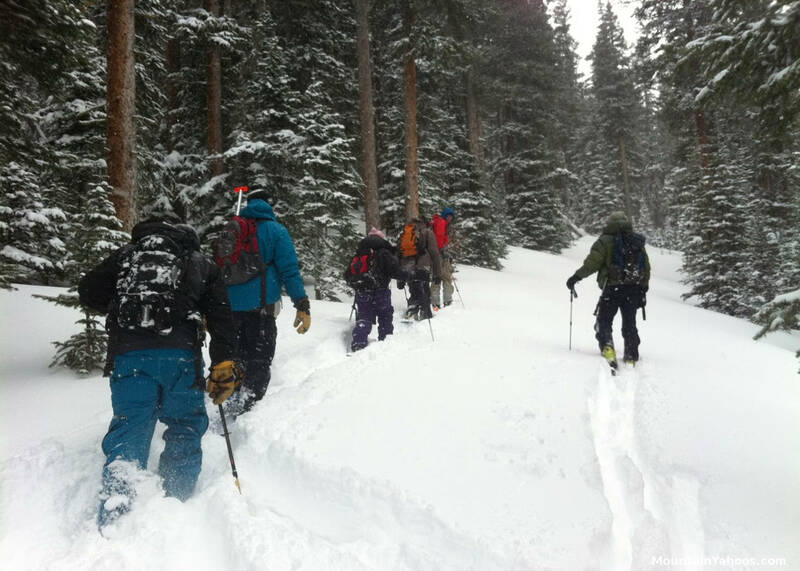 The most immediate danger of backcountry "off piste" skiing and boarding is the avalanche. 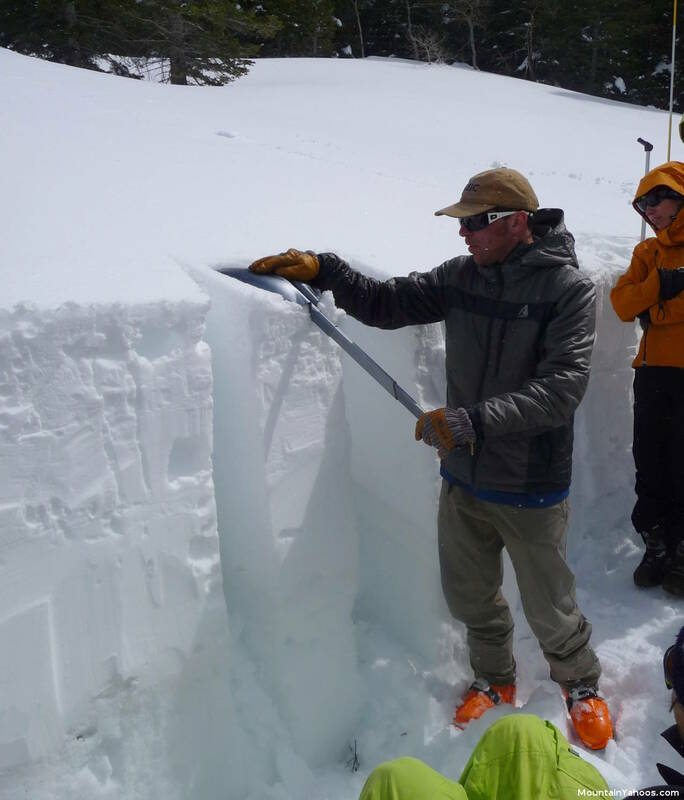 The study and understanding of avalanche conditions and detection of conditions conducive to avalanches help reduce your risk of encountering this danger. 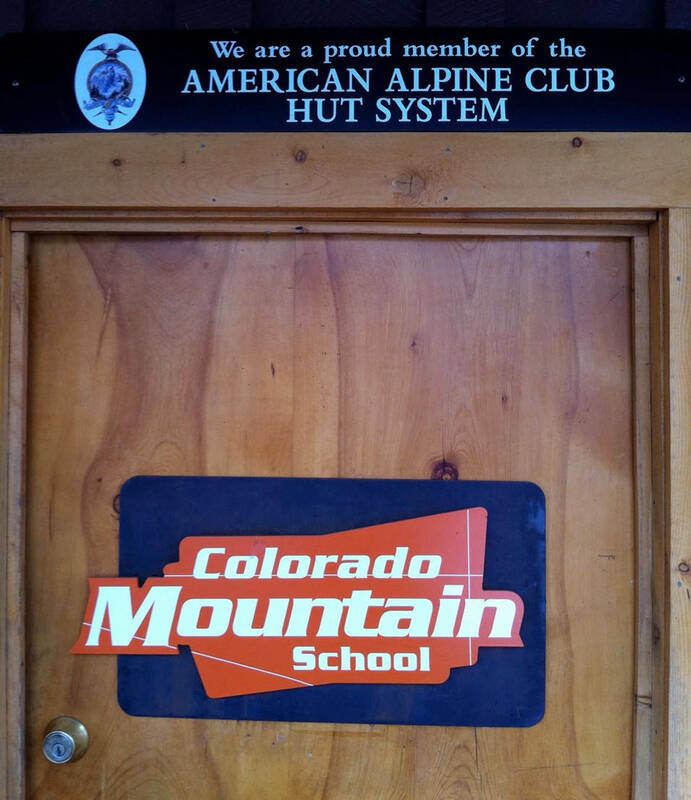 This page lists some of the education centers available and shows photos of the training experience at the Colorado Mountain School and California Sierra Mountain Guides - Avalanche Education Course. 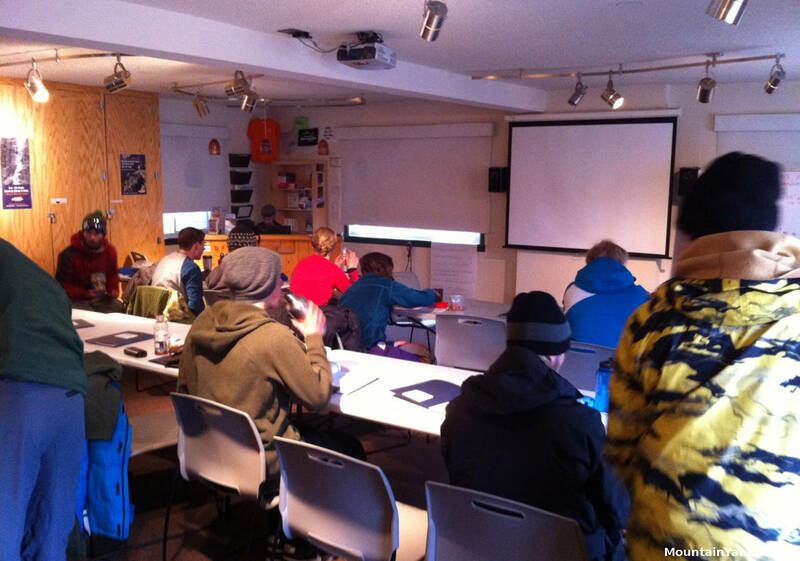 The following are photos taken during the Colorado Mountain School - Avalanche Education Course (3 days). 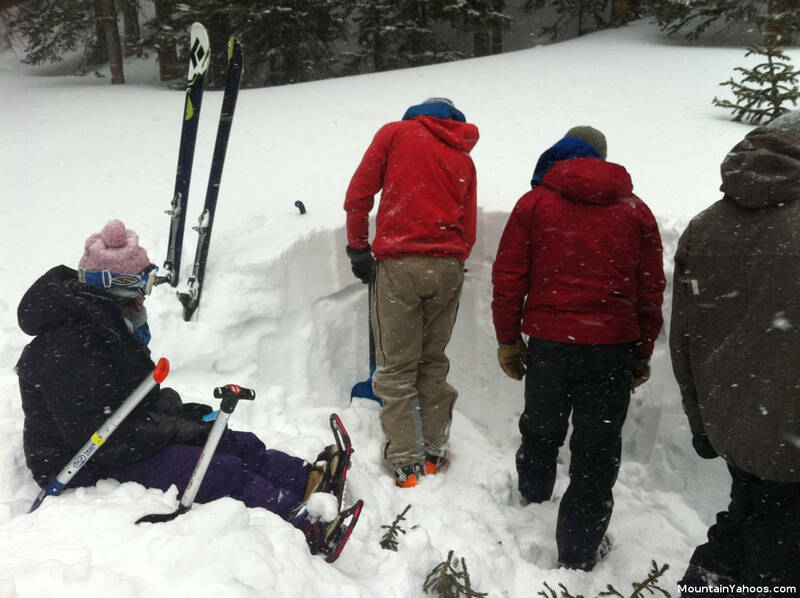 The class dug a snow pit and are analyzing the snow pack. The class learned to analyze the different layers and look for dangerous clues. The class instructor explained the significance of the snow fracturing along weak planes. Following that, the class performed a compression test. In a compression test you place your shovel on the snow and tap on it lightly. After about 10 hits, increase the strength of the hit and observe changes. If a big slab breaks off, that means there is a strong layer over a weak layer, which is a danger signal. Fracture lines will occur depending on how much compression is applied. 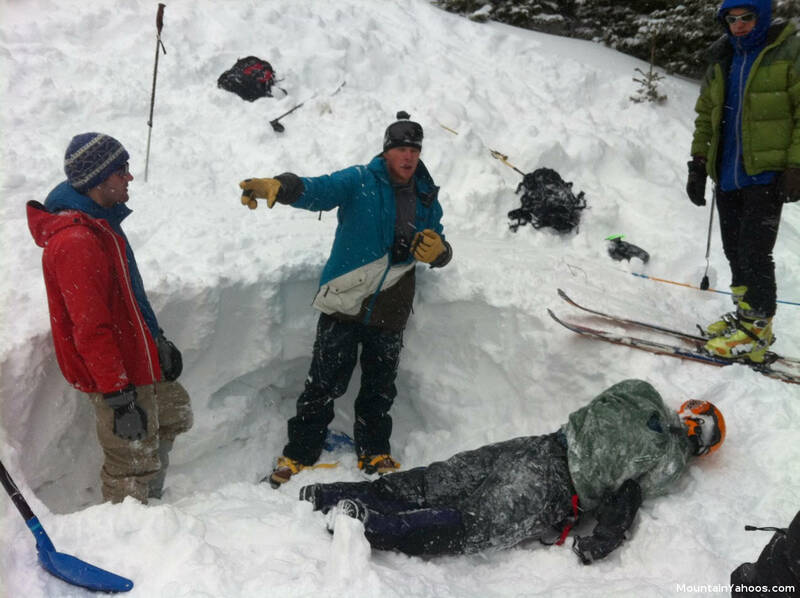 If a fracture occurs under a light compression load then the snow pack is providing a dangerous avalanche condition. 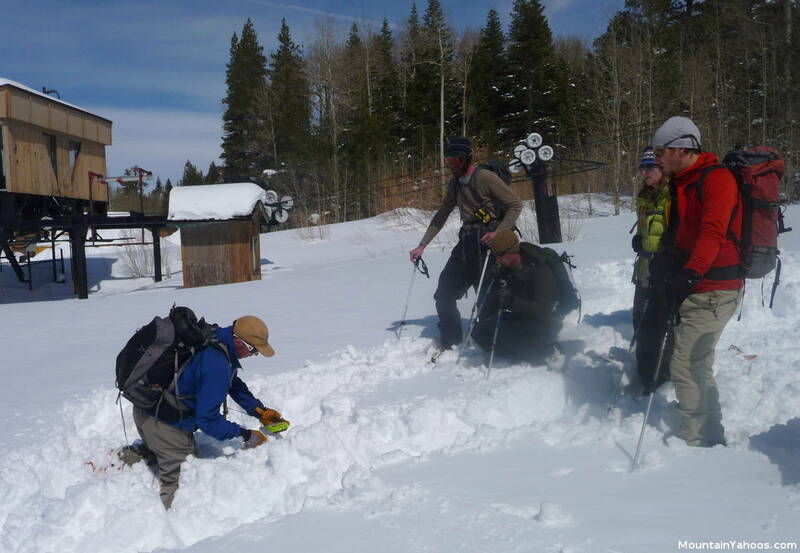 The avalanche search and rescue field exercise was to use an avalanche beacon in receive mode to locate a transmitting beacon burried beneath the snow. The next step is to use probes (hopefully a probe line of people) to find the exact location of the burried body. The beacons and probes were used to locate a buried person (in this case a dummy). 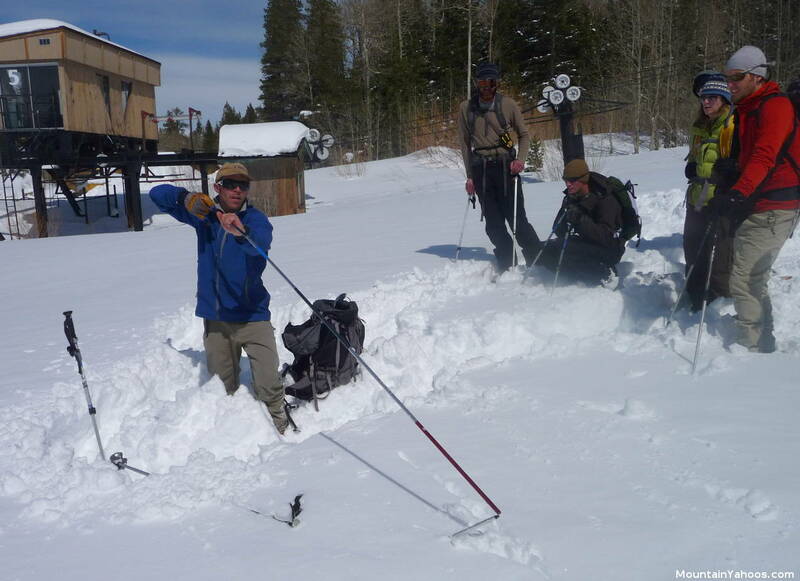 The area is searched using probes to poke into the snow to locate the body and dig it out safely. Ideally this is performed within 15 minutes or less. Longer periods of time reduce the chances of survival. The dummy is on the right and the class had to dig him out of the hole. 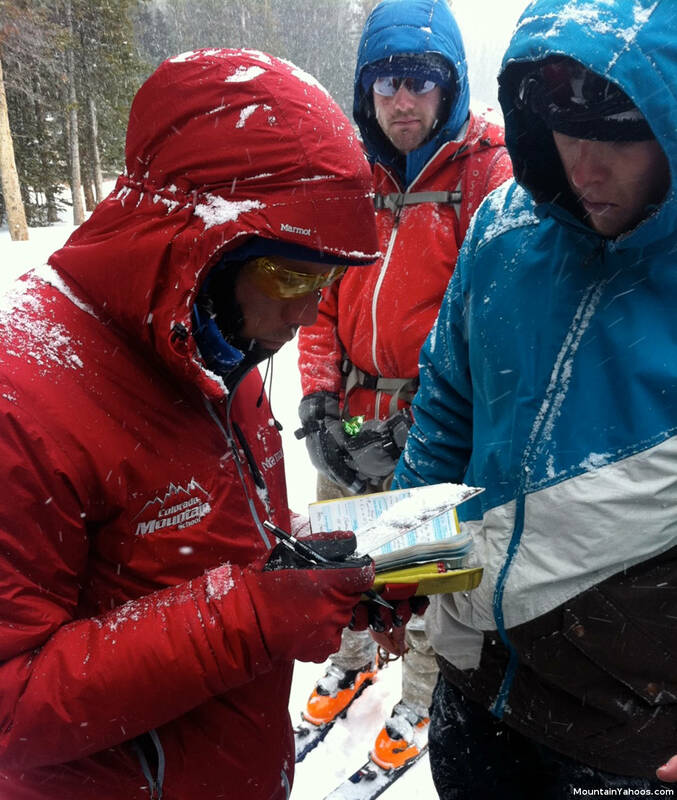 Also see MountainYahoos.com Avalanche Gear for essential backcountry gear including shovels, probes and avalanche beacons. Also see our video clips on that page showing some of the latest in back country gear. The instructor observing the weather and analyzing the snow fall on the snow card and examining the shape of the snow crystal. A traditional well formed crystalline snow flake will create a strong layer of snowpack because the flakes will bond together. 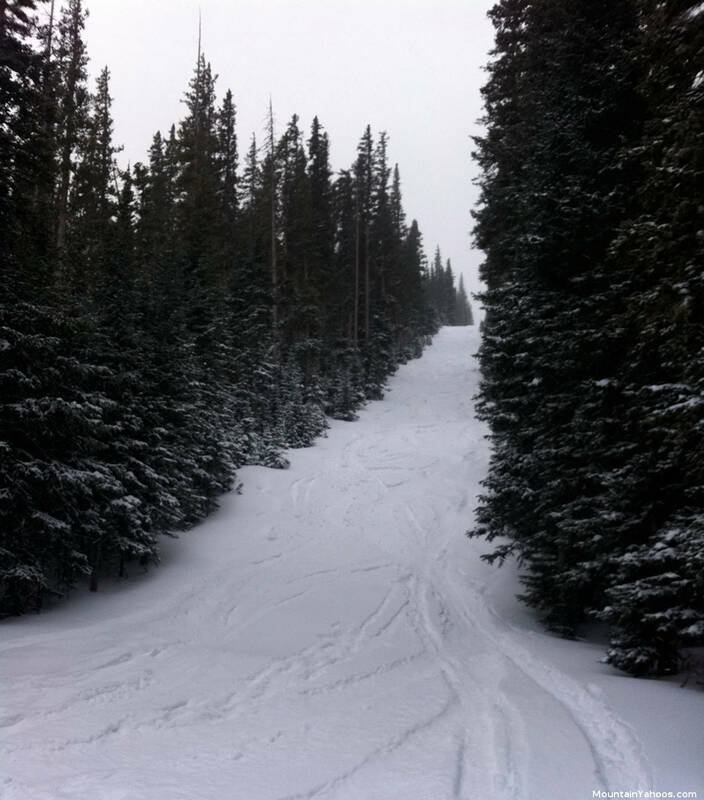 If round or faceted flakes are falling, then the new snow can create a weak layer which can lead to the creation of avalanche conditions. These weak layers are known as a "surface hoar" or a "death hoar". 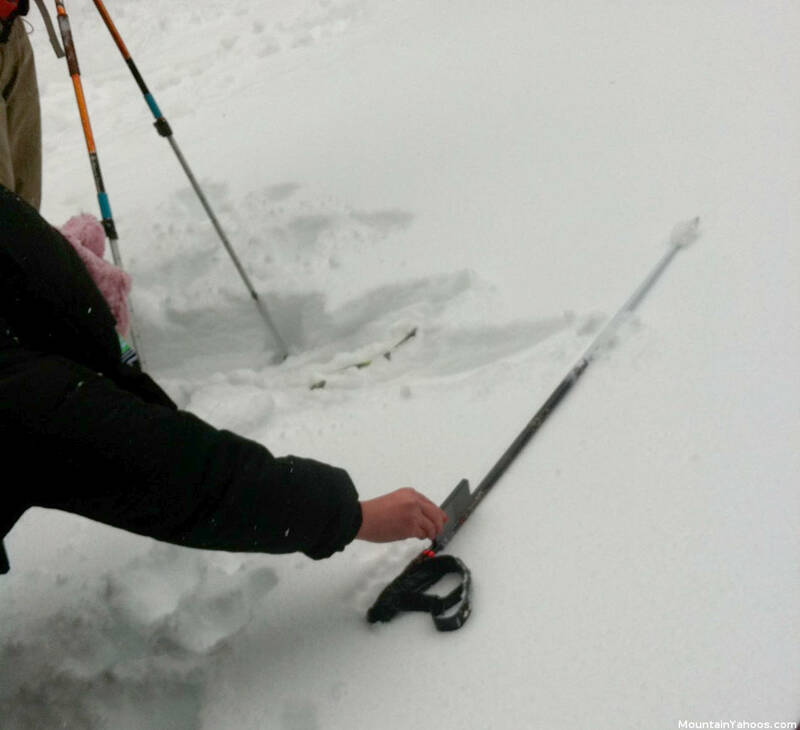 Learning how to measure slope angle by laying the ski pole down and using a slope meter to make the measurement. The ideal angle for avalanche formation is 30-45 degrees. An inclinometer can be used to accurately measure this angle. Slope Angel: digital slope angle gage makes measurement easy. The classroom where the class learned important information in group discussions and lectures. The class also watched a few short videos. 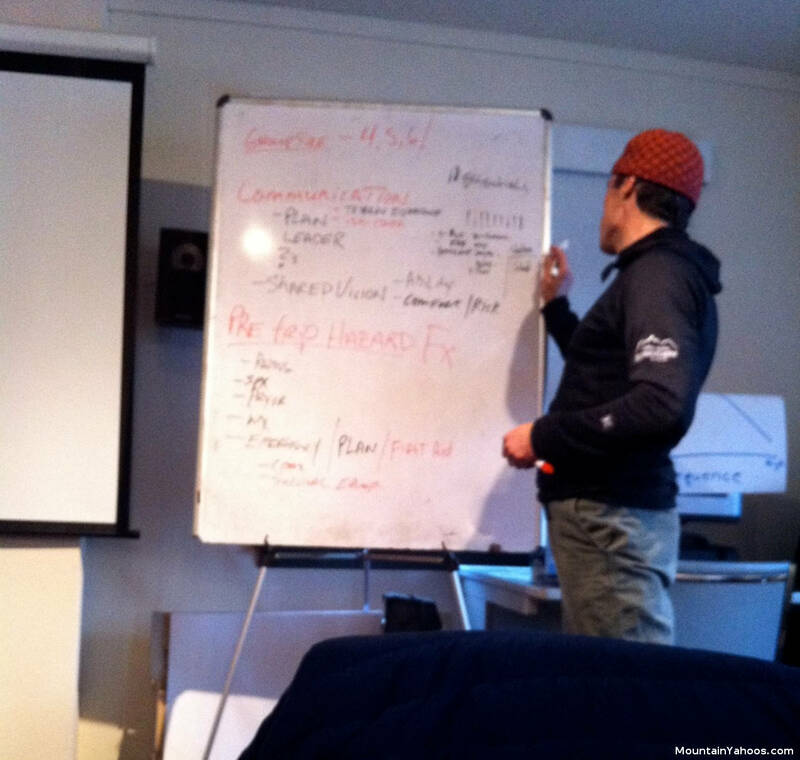 Learning about avalanche skills via the white board. An avalanche is a sudden flow of snow caused by a the release of the snow from the hill or mountain. The snow releases when a layer of snow is weak and releases the snow held above it. The study of the mechanics and causes of this release has lead to a basic understanding of the conditions by which an avalanche occurs. 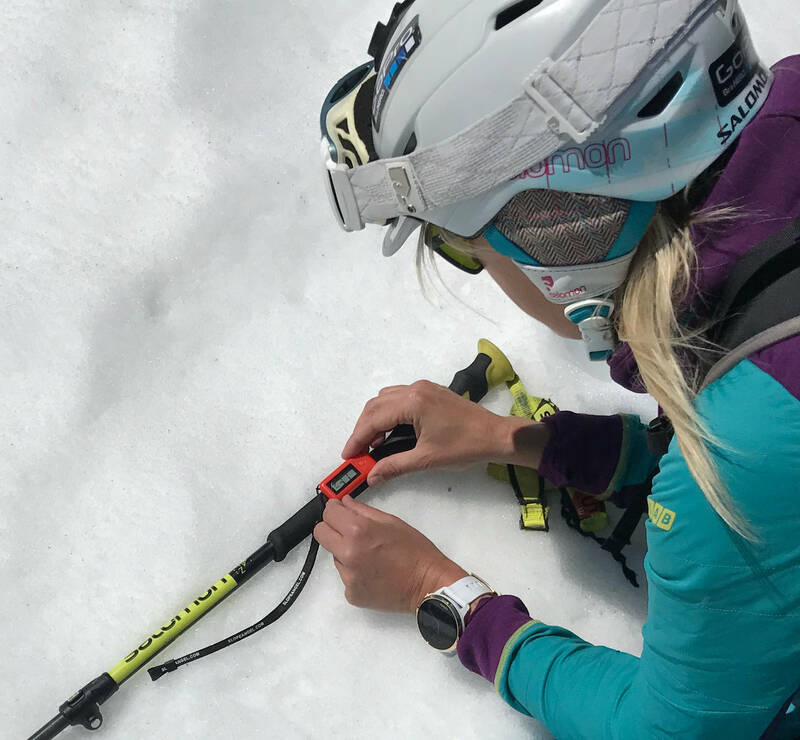 While it is not an exact science, enough can be learned to reduce risk or to recognize when the risk of an avalanche is elevated. 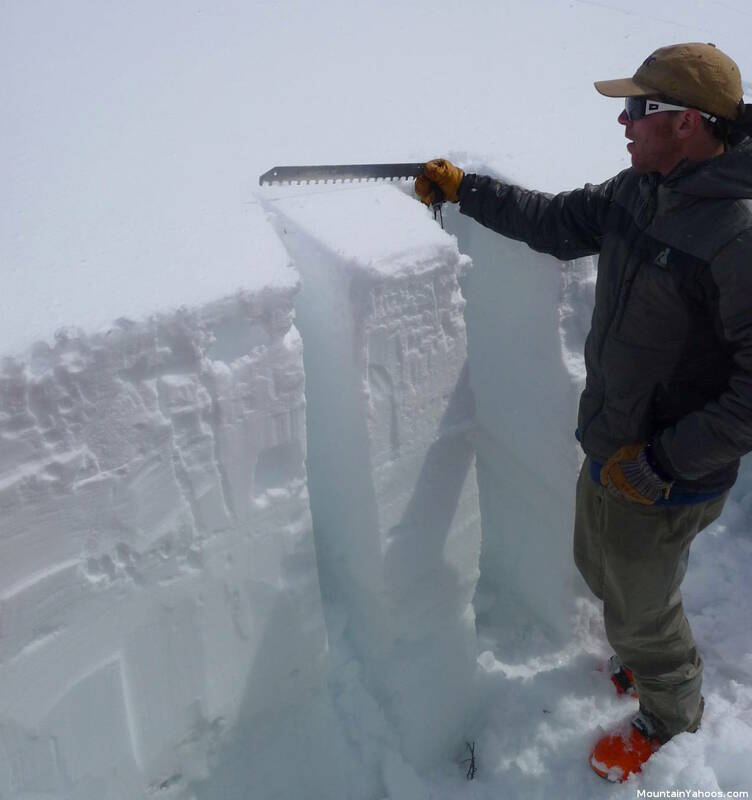 The study of the snow pack layers and the adhesion between the layers has lead to this estimation of risk. The build-up of snow has been quantified into engineering terms to define the tensile strength of the snow pack as defined by the properties of the snow crystals, the shear strength (slip strength) and ductile strength (deformability). It is the variability of the snow itself which makes this a science of probability. The measure of an avalanche size, mass and destruction potential is a logarithmic scale of five categories where 1 is harmless to people and 5 is massive. The American and European avalanche risk table gives a risk rating of 1 (low) to 5 (very high). The vernacular varies. 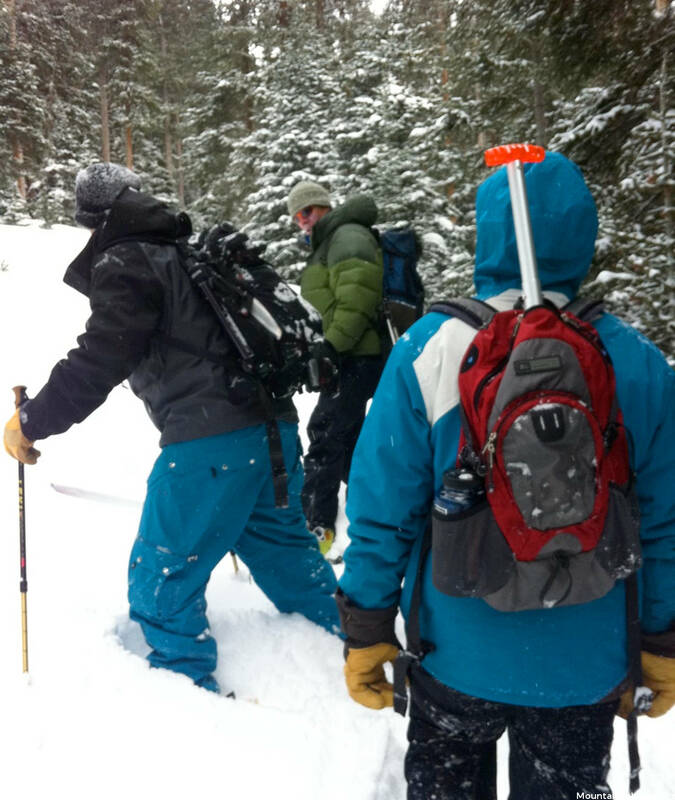 Also see MountainYahoos.com Avalanche Gear for essential backcountry gear.